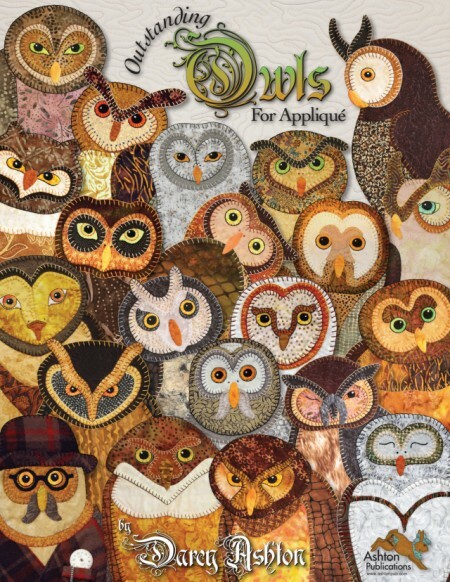 Outstanding Owls For Appliqué is here! Darcy Ashton has long been known for her incredible series of animal appliqué books. We’ve seen her Darling Little Dogs, Big Beautiful Dogs, Claire’s Cats, Grandma’s Bunnies, Butterfly Dance, and more! These popular classics are now joined by a bookful of the most amazing owls. There are 20 of them in all, each one with its own expression and personality. Add that to the fact that you can easily create new variations by mixing up the different body shapes, heads, and features, and the owlish possibilities are endless! This book couldn’t be more jam-packed. Just take a look at the Table of Contents! 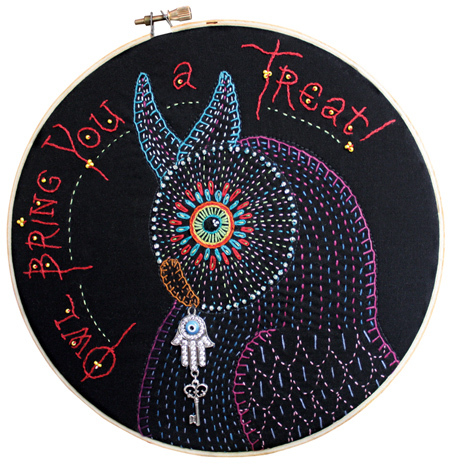 In addition to the appliqué patterns, Darcy gives you tons of information on appliqué, both hand and machine, plus how to make those fetching eyes, plus how to enhance with quilting, plus a slew of different projects! Not to mention embroidery. Swoon. One of my favorite touches is the idea of giving the owls little flowers or quilt squares to hold. So darling. Darcy sent me a copy to give away! Before I announce the drawing, let me reiterate how to enter. Leave a comment at the bottom of this blog post. If you send me an email by repying to your email subscription feed, or if you leave your comment on a different blog post, you will not be able to be entered in the drawing. Sorry for the constant reminders, but there are always a few, still. Now for the fun part! If you’d like to win a copy of Outstanding Owls For Appliqué, please leave a comment at the bottom of this post before 7:00 p.m. California time on Wednesday, September 9. Drawing open to U.S. mailing addresses only. This looks like a very fun book! 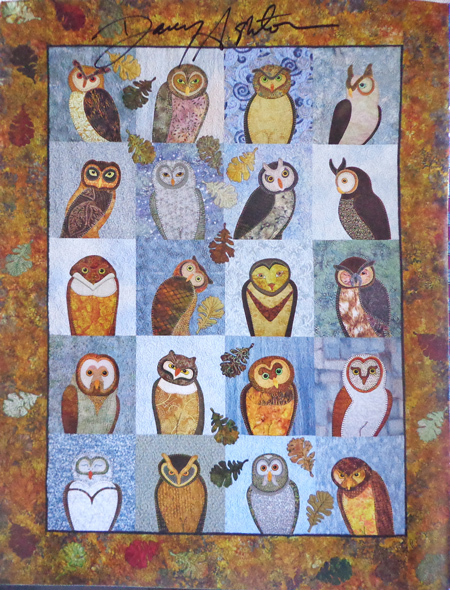 I love how the owls look all together in the quilt. Thank you for the sweet giveaway! I need to check out her other books. What a cute book! I absolutely love owls. I did owl crocheted hats for my gkids and my gneices and gnephews. Absolutely fell in love with this book! The quilt is stunning.Thanks for the giveaway! wonderful opportunity! The Owls are so fetching, and I can see lots of projects with them. Thanks! I love Darcy’s books! And I love owls, so I would be particularly excited to win this. Thanks, Kay! I love these designs! Thanks to you and Darcy for the giveaway. Love these owls. I live in the woods and hear them all the time. Darcy captured their essence! This looks amazing – such creative ideas! lovely owls! Very talented lady! I love darcy’s books. Can’t wait to add this book to my collection. Darcy is so talented! I just love her owls book and would love to have a copy! Thanks for this opportunity. I love, love, love this book and have been searching for just this.Thanks for the chance. What a beautiful book full of whimsical owls. Great review Kay. Her whimsical owls are gorgeous. This looks like a super fun new book that has versatile designs. 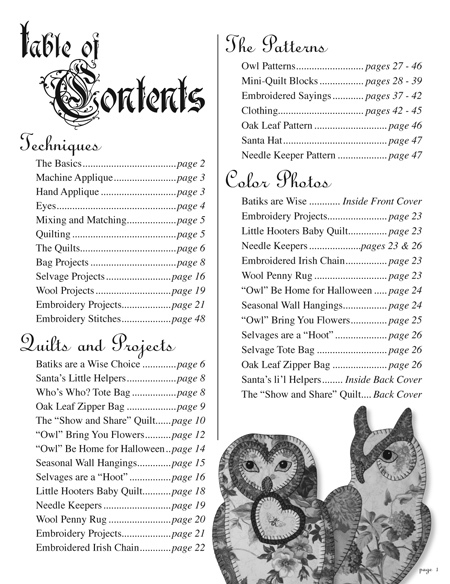 Oh, my — I love owls and love Darcy’s books and projects! Thanks for the great giveaway. Oh.my.gosh! The cutest things EVER!! How very sweet of you both to offer one up as a giveaway!! Fingers crossed!!! Looks like hours of fun to me. I have all of her books and have her dogs, cats, bunnies, & frogs in the digitized versions. Would love to win the owls! Thanks so much for the opportunity. 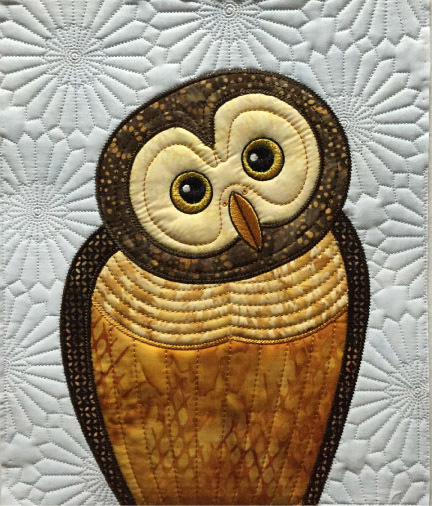 I love the owl quilt, that is gorgeous. They would make beautiful single wall hangings too. Would love an opportunity to win her book. Love the owls, such a beautiful pattern and gift. Would love to Win! I love owls; this book looks perfect. It would be a “hoot” to win. Thanks for the chance. I hope I win this book. I just love owl faces. If I don’t win I’ll be buying this book. Thank you. Oh my goodness, what adorable owls. Love them all. Thanks for the chance to win them. Just what I’m looking for, owl patterns for a certain niece. Thanks for the chance to win. Love the owls. Thanks for the giveaway. I would love to win Darcy’s Owl book. Thank you for this opportunity and for the lovely blog. I have the bunny book already and love it! But this owl book is just outstanding! Thank you for the giveaway! Love the owls! My granddaughter is learning to applique and I’d love to give it to her. I love this book! I adore owls and have never seen a resource like this one! I love these designs! So much fun! Darcy’s books are all awesome, and I would love to win a copy of this book! I can’t wait to try these out! The expressions on the owls are wonderful! Thanks for the heads up about the book. Oh that would be fun to win this book. I really like doing machine appique. I just bought myself an owl ring! We love owls. We occasionally here them when all else is quiet. Darcy’s work is fantabulous and I would love to have access to her new book. Thank you for the opportunity! I have recently become a big owl fan. This book looks like fun. Lovely book! Really cute owls and projects! i love Darcy’s books. I would love to win this! What cute owls! I love the quilting as well. Thanks so much for the giveaway. I love all of Darcy’s books, & have had the privilege of meeting her in person several times. Love these designs. It is so nice to see owl designs making a comeback, they were so popular in the late 70’s and early 80’s. Telling my age! The projects look amazing! I have three daughters at the same college and the mascot is an owl. There is a special burrowing owl habitat on campus. Needless to say owl items are big around our house. Thanks for the giveaway. Oh I really must have this book! I have been collecting owl patterns for a while now! Great looking Owls. They would be perfect on so many projects.